Dr. Loeb specializes in both routine and difficult contact lens fittings to maximize patient’s ability to see without glasses. Contact lens fitting can be especially challenging in patients who have had previous eye surgery, including corneal transplants, as well as corneal conditions that make contact lens fitting difficult like Keratoconus. Thanks to the many advancements in technology, patients have numerous options to chose from to find the right contact lenses to fit their visual needs and lifestyle. Daily-wear lensesare designed to be put in when you wake up and taken out before you go to sleep. Extended-wear lenses are designed to be worn longer than 24 hours, even while sleeping, and in some cases, up to 30 days. 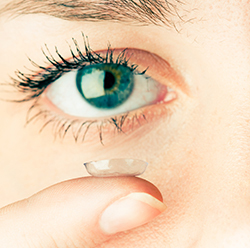 Bifocal contact lenses are lenses that offer two different prescriptions in a single lens. One prescription is for close reading, and the other for normal, distance vision. The dual prescriptions help people who suffer from presbyopia, where age-related changes to the eye cause difficulties in focusing on close objects. Dr. Loeb works with many contact lens manufacturers to offer you the latest in contact lens technology. Please contact our office today to see what we can offer to make your contact lens experience more successful.